The more I try to make things visual, the more I appreciate the value of visual communication. When I was asked to lead a team responsible for placing information related to membership on the SME website, I needed to make the waste visible for them. The website itself was the gemba (where the work happens) so working my way around it was a “go and see” process. First, I located pages where visitors were most likely to start (from the “join” button, for example) in order to learn about membership, or do something membership-related. I printed the “start” pages to help me trace links as deep as I could go, then I printed the “destination” pages. It did look like a lot of paper wasted, but just looking through the website does not expose the complexity or range of the information posted there. It was astonishing. I found hundreds and hundreds of pages and documents. I took those piles of paper to a pair of soft walls that form an aisle through our office, and then started pinning up the paper. Nearly every page was replete with links. It was clear that I needed to represent the relationships among the pages somehow. String! It was slow work, but I traced every relationship among the membership pages. Strings led from each link on each page to the page it referenced. When the display was complete, the current state was inescapably visual. Yikes! By the time the kaizen team met, they had a pretty good idea what they needed to do. There was another benefit from this visual display process. Because the aisle was well-traveled, people casually walking by began to get the picture. 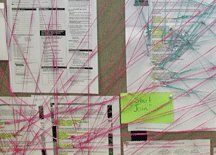 If you saw me painstakingly festooning the office walls with bright pink and green string, you couldn’t help but comment. I could engage people in conversation – from the maintenance guys to directors – about the state of the website itself, and to challenge them to learn more about membership. The Project Kaizen folks included boundaries as one of their elements of a successful project. During most of the last 12 months I have worked with three departments of SME on leaning out their websites. If you have ever visited the SME site, you may agree that it could use a lot of improving. One of its navigation problems is that there is just so much information to organize that it is just hard to represent all in one place. As the project began, it was confined by definition to "content." Another department was actually the owner of the navigation and overall design of the site -- I couldn't infringe on their territory without causing problems. So the content boundary was useful, and could be stretched in a number of ways. One benefit that I didn't anticipate was the way it eliminated a big source of waste -- the waste of standing around and complaining. Periodically team meetings digressed into criticism and frustration about usability problems in the overall site. The team members were regularly treated to bigtime complaints from customers, so they were sensitized to it. But our boundaries and organizational realities gave us little influence on the overall site's characteristics. So I had a big stick - our agreement as to boundaries. When talk would head in that direction, I'd just remind people -- sometimes forcefully -- that the global navigation was outside the scope of our project. We wouldn't duplicate its purposes in the hope of giving users workarounds and we wouldn't use up time on pointless discussion. We had ample opportunities within the scope of our project to improve usability, and that's where we would concentrate efforts. We kept in mind that we couldn't solve all problems in one project, but we would improve what we could. And we did. As I reflect on the bloggers (Gang of Seven – see my links at the right) who’ve tacked “Project Kaizen” last week, I have to start with a confession – I haven’t read all the posts yet. Before the event itself, the foundation was set by a bunch of industry folks madly e-mailing and carrying on conference calls. It became apparent to them that the only way to find consensus on the requirements was to get face-to-face – a point Jon Miller made about the Gang of Seven project itself. SME hosted a marathon work session. There was a detailed agenda for three and a half days, with the outcome to be a process for recording a portfolio of experience, a mentoring process, and a comprehensive exam. Furthermore, there were four levels to define. The kaizen-ing of their project started the first thing in the morning on the second day, and tearing their schedule apart was business as usual for the participants. They had scheduled one of their reflection sessions for that morning in order to review their problems and progress and reorganize their activities. The knottiest problems had emerged in the portfolio group. There were many different views of how experience should be documented. More importantly, the mentoring process and the portfolio process were not dovetailing. It was easy to see that a lot of “storming” had taken place already. 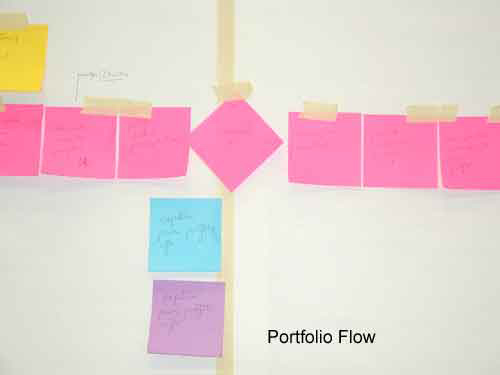 The previous day’s work was visible – sticky-note process-flow maps and flip-chart sheets covering the walls of the two adjoining conference spaces. The whole crowd made a stand-up tour of the visuals and learned of the roadblocks. They decided that Day Two’s plan would be amended to take on some serious problem-solving, as their assumptions about mentoring and portfolios were challenged and clarified. A couple of other aspects of project kaizen were visible at this point. The portfolio and mentoring requirements represented critical customer-supplier connections. The protégés would be seeking guidance from mentors as they built their portfolios, and the mentors would not fulfill their own requirements without a productive relationship. It also represented critical hand-offs, which the Gang of Seven bloggers explored in detail. As lean practitioners, the participants wanted the simplest possible means of communication between protégé and mentor – an A3. If you haven’t run across A3s yet, there’s no magic. A3 is just the European designation for an 11” x 17” piece of paper. You can boil down a lot of stuff to fit on that size sheet, but simple is always more work than complex. But more about portfolios on another day. Why another blog on lean? The self-described "Gang of Seven" has been posting some exciting material on "Project Kaizen." I've commented on some posts, but with all my opinions, it's not quite enough. I need my say. I also try to relate posts about lean to my own projects and want to be able to talk about that without cluttering other blogs with my stories.